We've been watching things burn up in the sky for thousands of years. But it wasn't until the early 1800's that we realize that those things were in fact chunks rock and metal from space that were disintegrating as they entered the Earth's atmosphere. We should have taken this as a warning. Once we started to explore space travel it didn't take long for us to figure out that getting back down to the ground was gonna be almost as hard as reaching space in the first place. However, for nearly a century we've been mastering the Science of re-entry. Well, today astronauts entrust their lives to some wonderfully complex mathematics that allows them to survive the most dangerous part of their journey ― the return home. An object said to enter the Earth's atmosphere when it crosses what's known as the Karman Line - a 100 kilometers above the surface of the earth with the atmosphere becomes dense enough to support traditional air flight. It is also to where the atmosphere is dense enough to support planes and it's too dense for spacecraft be traveling extreme speeds. Take our beloved retired space shuttle. When it began its descent back to the Earth's surface it entered the atmosphere at a pace of smelting seventy seven hundred meters per second (7,700 m/s) and that was after it slowed down considerably. Thick atmosphere is like running into a wall of air. The air doesn't have time to move out of the way of the space craft. So, it just compresses and the more its compressed the hotter it gets. Up to the 1,477 degrees Celsius in the space shuttle's case. Any craft not to specifically designed to withstand that kind of heat would burn up entirely! However that compression isn't the only problem, there's also gravity. Upon re-entry, spacecraft begin to decelerate very rapidly - where its speed is about seventy seven hundred meters per second (7,700 m/s) to a full stop on the runway in about half an hour. Traveling at less than seventy seven hundred meters per second that's about 28,000 kilometers an hour. It will just result for your craft bouncing right off the atmosphere. What is the Right Angle? Likewise, the angle of the space craft enters the atmosphere is incredibly important. If you try to enter the atmosphere at too shallow angle you'll simply skip off the surface. Going too steep, the craft once at the atmosphere too quickly causing huge spikes, gravitational forces, and heat that astronauts might not survive. 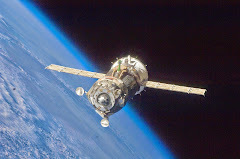 This was what happened to a Russian Soyuz vessel in 2008. Because of a malfunction the craft came into steep and went through what's known as a Ballistic Re-entry, which thankfully they survive. The lesson here is that the angle approach has to be somewhere between these two extremes. What angle you need depends on the size and shape of your craft. A streamlined craft can more easily penetrated a shallow angle while a blob shape can more easily survive the heat. Plus, every spacecraft has its own specific angle of attack but generally that's about 40 degrees. Steep enough that it can penetrate the Karman line but shallow enough that you know everybody survives. The precise angle and specific point of entry are together called the Re-entry Corridor and its location depends on where the craft is supposed to land. The surviving re-entry as you might expect relies on a math―it's rocket science after all! Of course, you also need a craft that made from materials that can shielded and its contents from the extreme forces of re-entry. Thank you for reading Returning Home and Re-entering the Earth's Atmosphere is The Hardest Part of the Space Exploration posted on the website Kwentology if you want to redistribute this article please include the link as the source. Have some kuwento to share? Contact us!